Sweet Briar Outdoors is ready to outfit you for your next adventure. All equipment rentals are free for use on Outdoor Program trips, at the Outing Cabin and at the on-campus campsite. If you are heading out on your own to enjoy the beauty of the area, let us help outfit you with the right equipment for a successful trip. 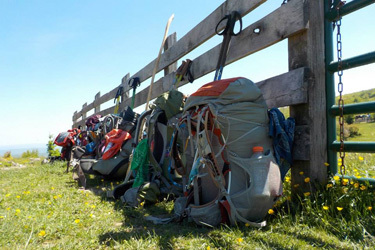 We can supply everything from backpacks and climbing shoes to stoves, tents and sleeping bags for reasonable fees. See the chart below for current rental pricing. A daily rental period is roughly 24 hours. For weekend rentals, equipment is picked up on Friday and returned Monday. Rentals for longer periods of time will accrue the “additional day” cost per day of rental past a weekend. Stop by the Outdoor Program office or email sbcoutdoors@sbc.edu to reserve equipment. Equipment rental is available to current students, faculty and staff only.